Only four miles from Otter Creek Reservoir and nestled in the Grass Valley, the Rockin’ R Ranch is the ultimate escape from the pressures of the business world and a great place to hold your Ranch Business Retreat!. The down-to-earth atmosphere fills the air and permeates everything at the ranch. After a few days on a ranch business retreat, you will unwind and soak up what nature has to offer. Your organization will go home better workers—and better people. 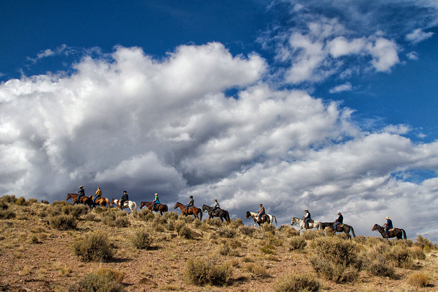 All of our regular ranch activities are included with your ranch business retreat, as well as some special “team-building” activities in our arena. In addition, you can meet in our conference room, multipurpose room or outside at one of our Cow Camps. We’ve created a great opportunity for you to make your Business Retreat even better, whether you’re with your families or not. Our South Ranch Cliffs area is set amidst the calm and alluring south fork of the Sevier River and against majestic cliffs. Spend an afternoon of your stay with us enjoying new activities for your group. You’ll enjoy competing in our Tomahawk-throwing contest and learning how to use a Bullwhip to pop balloons. Play a game of Horseshoes or Fish in the nearby river. Your children may enjoy making Native American Crafts. And for those age 12 and older, there’s even more adventure—Rock Climbing and Rappelling! Climb up our natural river cliffs to the most breathtaking views in the valley, or you can rappel over 200 feet onto the banks of the Sevier River. Cap off your enjoyable afternoon with a delicious Dutch-oven meal cooked over the campfire as you reflect on whether you’ve ever seen so many stars in the sky. This is definitely an experience you won’t want to miss! We can add this experience to your retreat package at a minimal cost, depending upon the size of your group. When making your reservation, be sure to ask for a rate specifically tailored to your group. We customize every ranch business retreat to provide you with unique event and experiences. We’re very family-friendly, and can give your spouses and/or children unforgettable experiences while you and your colleagues are enjoying your ranch business retreat. Simply outline what your requirements are, and we’ll provide details and quote a price.